What Type of Crate Do We Recommend? All of our customers ask us the same question "What type of crate do you recommend us buying for our new puppy?" 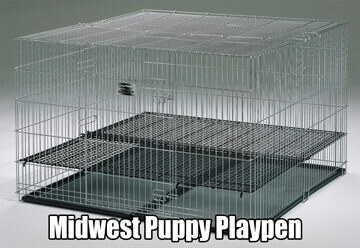 We recommend you purchase the Midwest Puppy Playpen because it's completely different from all the other crates. Unlike the crates you would purchase at Petsmart or Walmart where the puppy would be sitting in its own feces. The Puppy Playpen has an adjustable raised floor which is ideal for training your puppy. The floor keeps the puppy elevated above the plastic easy to clean trays. If your puppy were to have an accident while you were away, he would not be sitting in his own feces until you returned. This crate can be used throughout the puppy's lifetime and its double-nickel chrome-plated finish will never rust. You will never have to buy another crate again. It has openings from the top and side for easy access to your puppy. You can put your puppy's bed, toys, food and water bowls in there too making it a nice den for your puppy. Long ago, wild dogs found small dark places that were just about big enough for them to lie down in. These "dens" offered protection from enemies while allowing the dog to feel safe enough to let his guard down. Todays domesticated dogs no longer have to fend for themselves in the wild. Most live in safe comfortable homes with loving families. Still, the instinct to have a safe place that is theirs only lives on. Providing a crate for your dog satisfies this natural instinct. Remember that dogs are very social animals. If given a choice they will choose to be with you as much as possible. With that thought in mind your kitchen, living room or bedroom are good places to set up his crate. Your dog can have his "safe" place and still be close to you. Crating aids greatly in housetraining your dog. Crating a dog when traveling in the car is much safer. A crated dog is much easier to handle on trips to the vet. Crating a young dog minimizes the damage to your home and furnishings when you are not there to supervise him. Your goal is to get your dog to feel as comfortable and safe as possible in his crate. A good way to start this process is to remove the door from the crate. Let your dog go into the crate on his own with you sitting near him on the floor if possible. If he is reluctant to go into the crate, you can coax him by playing with him and tossing a favorite toy just inside the crate. If a toy doesn't work you can put a favorite food treat just inside the door. If your dog enters the crate, even a little, be sure to praise him lavishly. Gradually, you can place the toy or treat further into the crate. If the crate is big enough you can go into the crate and coax your dog inside with you! I have done that before with my own skittish Shiba Shadow and it worked wonders! Once your dog is comfortable being in his crate you can reattach the door. Begin by closing the door for short periods while staying with your dog and giving him praise and encouragement, then open the door and allow him to come out. Keep the time short at first so your dog does not become scared and panicky. You want your dog to associate being in the crate as a good thing. Increase the time he stays in the crate gradually while always giving praise and encouragement. Most dogs when comfortable being in their crate will go in and out on their own and will also sleep in it. If you are using a plastic crate and your dog seems uncomfortable in it, try using a wire one instead. Repeat the above steps with the new crate until your dog feels comfortable in it. Go slowly and take the time to make crate training a positive experience for your dog! The quality of the crate and materials will vary from one manufacturer to another. Look at several different brands before you choose. Examine each crate closely for rough edges and sharp corners. If the crate is one that collapses try it to make sure that it does so easily. When collapsed is the crate small enough to be carried easily? If you are considering a wire crate check to see how strong the bars are. You do not want them to bend if your dog pushes hard against them. If your dog gets his head or paws stuck in the opening he could injure himself. Some crates come with dividers in case you want to make the crate smaller and increase the size of the crate as your puppy grows. Be sure these dividers fit the cage well enough that there are no gaps or sharp edges. Choose a crate that offers enough ventilation for your dog. Wire crates offer the most ventilation but if you look around you can find plastic crates that have vents on all sides. Keep in mind that a well ventilated crate is cooler during the warm summer months. For airline travel, choose a plastic crate. Most plastic crates sold today meet or exceed federal regulations for air travel. If your dog chews anything he can get his mouth on or if the crate is going to remain in one place then a wire crate might be a better choice than a plastic crate. Taking the time and patience to crate train your dog is time well spent!